Summer weather means increasing electric costs for homes with air conditioners, and many homeowners are looking for ways to lower their electric bills. If your Southwest Oklahoma home has a programmable thermostat, you can use that as a tool to lower your energy bills significantly. By setting the thermostat to keep you comfortable and using your energy in a smart manner, you’ll see savings. Here are some tips to help. Keep the temperature steady – Once you find an energy savings point for your home, try to keep it at that point for at least eight hours, if possible. Changing multiple times per day can negate the savings of changing the temperature. Avoid overriding pre-programmed settings – If you’re feeling hot, you can override the setting on your programmable thermostat to cool off your home temporarily, but doing this regularly can consume more energy. Instead, try using a fan or changing clothes to help, or change the settings completely if you have an ongoing problem. Avoid overcompensating – Setting the temperature to a very high or very low setting isn’t going to heat or cool your home more quickly; it will actually lead to excessive energy use when you forget to put it back to your comfort setting after the house gets comfortable. Change the setting when you’re sleeping – Once you fall asleep, your body can handle a colder or warmer temperature. Adjust the thermostat to lower or raise the temperate by around 10 degrees when you’re sleeping to save energy. Set it and forget it – If you maintain a regular work schedule, set up a schedule so the furnace or air conditioner runs less when you’re gone, then forget about it. This will prevent you from forgetting to adjust the thermostat on your way out the door. These small changes may not seem like much, but they can add up to huge energy savings. 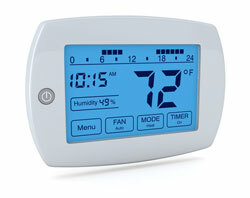 If you’re looking for more advice about using a programmable thermostat effectively, contact Davis Air Conditioning. We’re your source for Southwest Oklahoma air conditioning and home comfort needs. Posted on June 23, 2015 by D Custom.